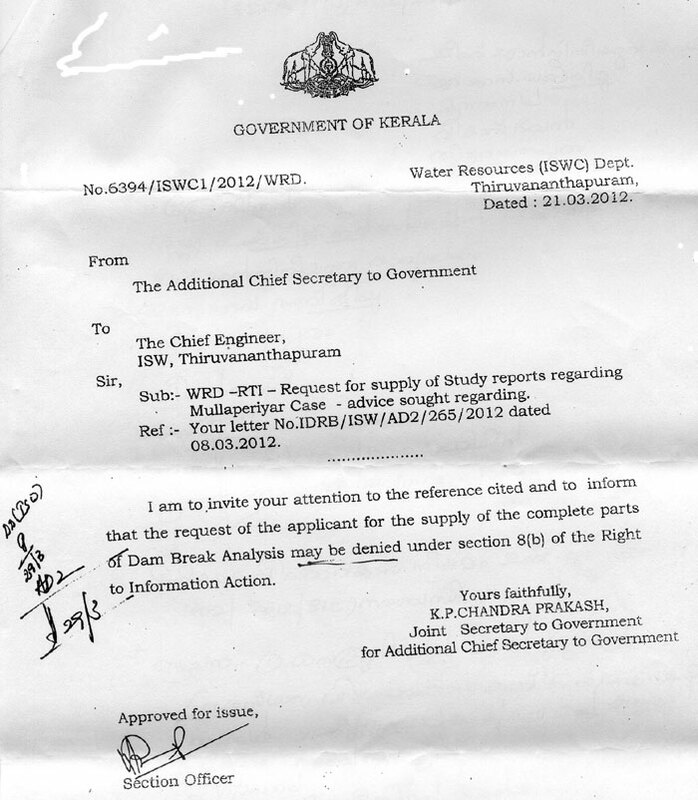 Additional Chief Secretary (Water Resources) of Kerala K. Jayakumar (now the Chief Secretary) has directed that the Dam Break Analysis (Mullaperiyar dam to Idukki Reservoir) should be denied to applicants seeking copies of it under the Right to Information Act. The Additional Chief Secretary cites Clause 8 (b) of the Act for denying the public copies of the dam break analysis. However, there is no such Clause in the Act. There is, however, a clause 1(b) under Section 8 which states that information which has been expressly forbidden to be published by any court of law or tribunal or the disclosure of which may constitute contempt of court could be denied to applicants. But, the Office of the Chief Engineer (Inter-State Waters) has failed to provide copies of any court order forbidding publication of the Analysis. Moreover, the analysis in question has been placed before the Assembly, and so, it has become a public document in every sense of the term. Moreover, Water Resources Minister P. J. Joseph himself had held a press conference disclosing findings in the Analysis at Thodupuzha. It is also notable that it is the practice world over to publicise results of dam break analysis and inundation studies so that the people are aware of the risks and safe areas. In some countries, it is mandatory to do such analysis and prepare evacuation plans at the time of construction of dams itself. These plans are always brought to the notice of the people and local authorities. This blog has published map showing area of submergence from the report of the Mullapeiryar Dam Break Analysis. This entry was posted in Environment, Kerala, politics, Water and tagged dam, dam break analysis, Mullaperiyar by Roy Mathew. Bookmark the permalink.